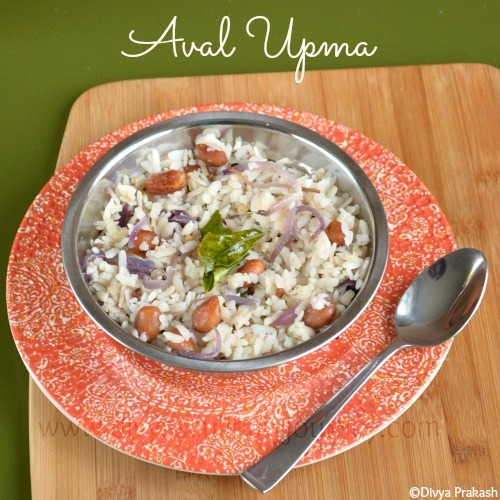 Aval Upma / Poha Upma is a simple breakfast recipe. 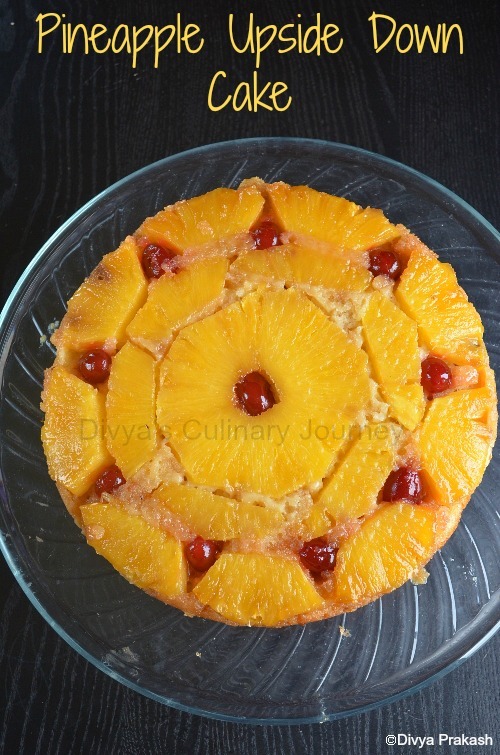 It is very easy to prepare and is ready in minutes. So when there is crunch for time, surely this dish comes in handy. 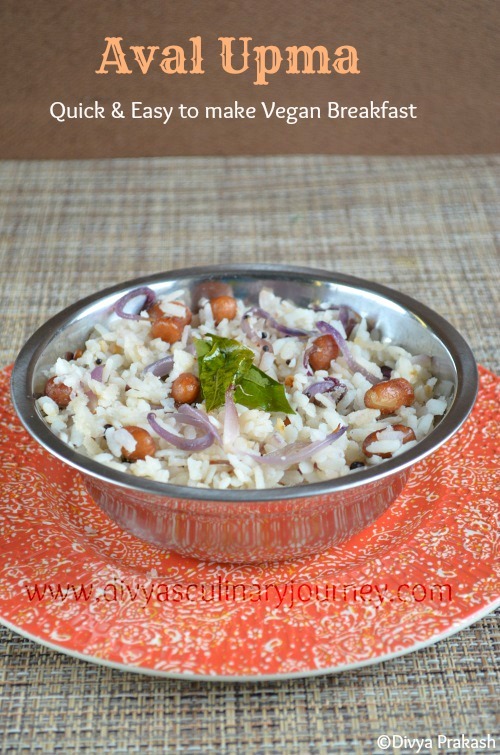 There are lot of variations that can be made with this aval/poha. 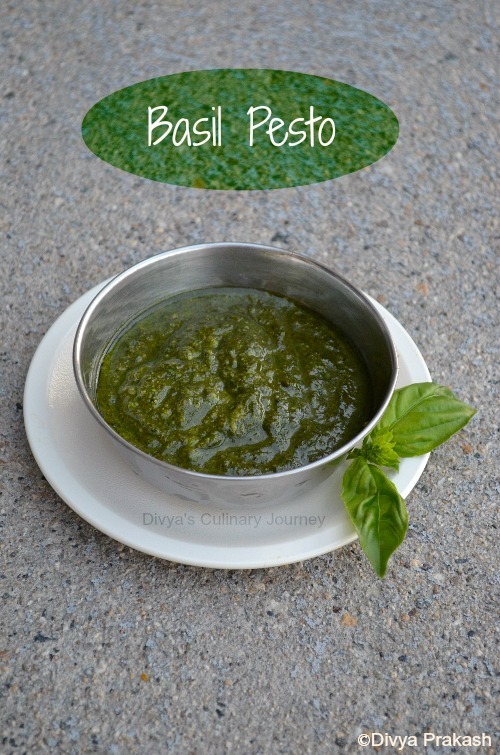 Today I am posting the basic upma recipe. I have posted another poha recipe with variation-Peas Pohe, some time back. Wash Poha in running water and drain the excess water and let it aside. Heat oil in a skillet, add mustard seeds, when they crack add urad dhal, Peanuts and fry for a minute. Then add chopped onions, slit green chillies, grated ginger and curry leaves and saute for few minutes, then add the soaked poha and salt to taste, mix well and serve. If the poha is thick, then let it soak in water for 5 minutes, then squeeze and drain the excess water and use. If poha is thin, washing will be enough. So depending on the variety of the poha you use follow the procedure. I have used roasted peanuts. If using raw peanuts, roast before and use. If you dont prefer peanuts you can omit them. 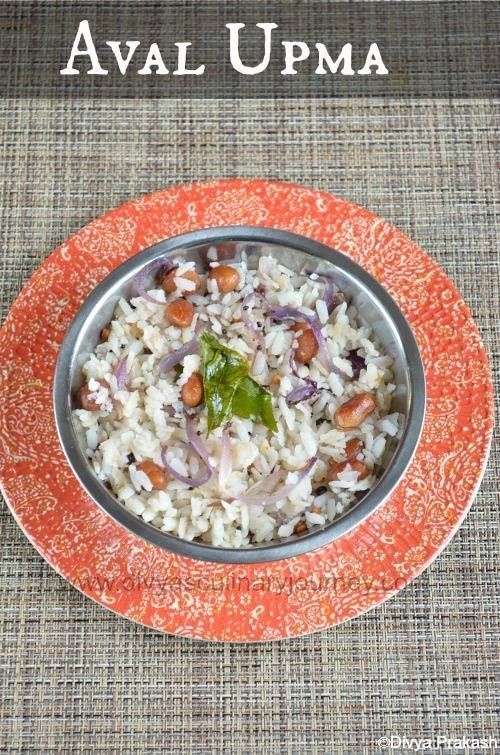 Instead of Urad dhal, you can use channa dhal/kadala paruppu too. You can also use a combination of both. 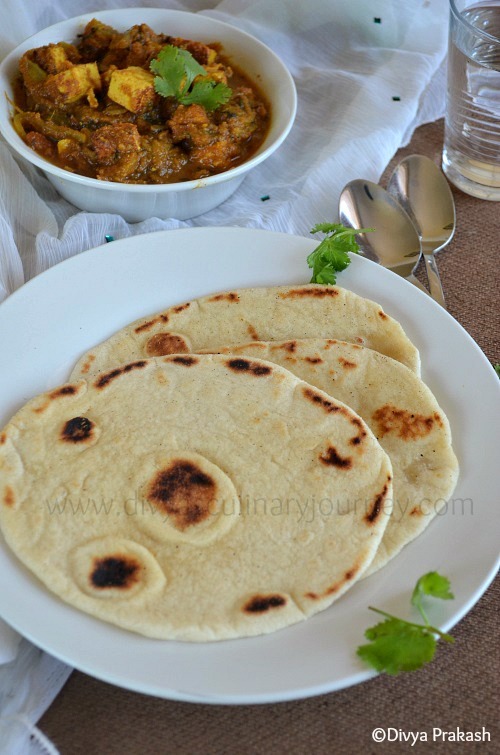 Naan is a leavened flat bread usually cooked in the clay oven(tandoor). 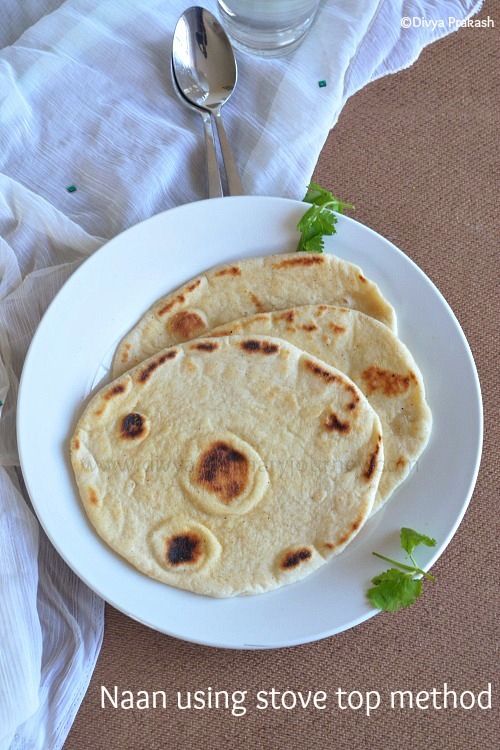 Everyone at home just love this naan and I make it often at home in the stove top using yeast. The naans come out really soft and fluffy. 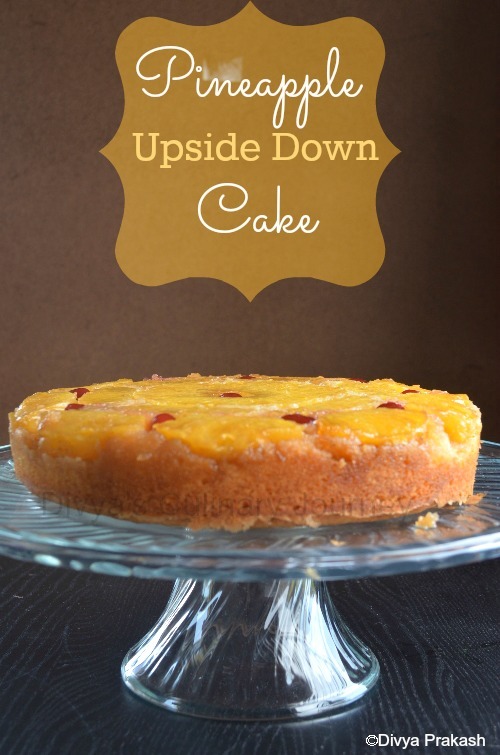 I wanted to share this recipe for so long, but couldn't get the pictures. 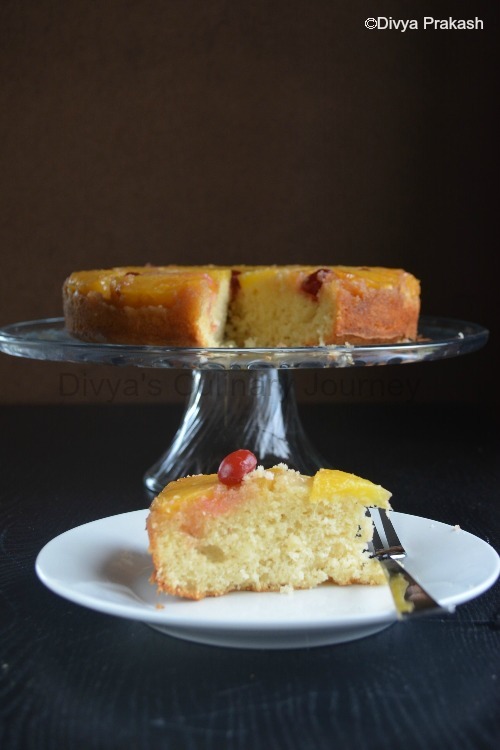 So finally I am posting this recipe here. In a bowl, mix sugar dry yeast and warm water and let it sit for 6-7 minutes till it is frothy. In another bowl combine All purpose flour, baking powder and salt. To this add the warm milk, yogurt melted butter and mix well and keep kneading, then add the yeast mixture continue to knead, (if water is required add little) keep kneading until the sticky dough turns out to be pliable dough and is not sticky. Take a bowl and grease it with butter and place this dough in the bowl, cover it with plastic wrap or damp kitchen towel and let it rise for 3-4 hours or until it is doubled in size. Then punch the dough and knead for few minutes. Divide the dough into equally sized balls and let it rest for 5 minutes. Then using rolling pin roll the balls into the shape of the naan. Heat tawa/griddle on high heat , apply melted butter on the naan and gently lay it on top of the griddle and cook till bubbles start to appear on the surface of the naan, then apply butter to that side and flip it to the other side and cook for another 1-2 minutes. Repeat the process till all the prepared naans are cooked. 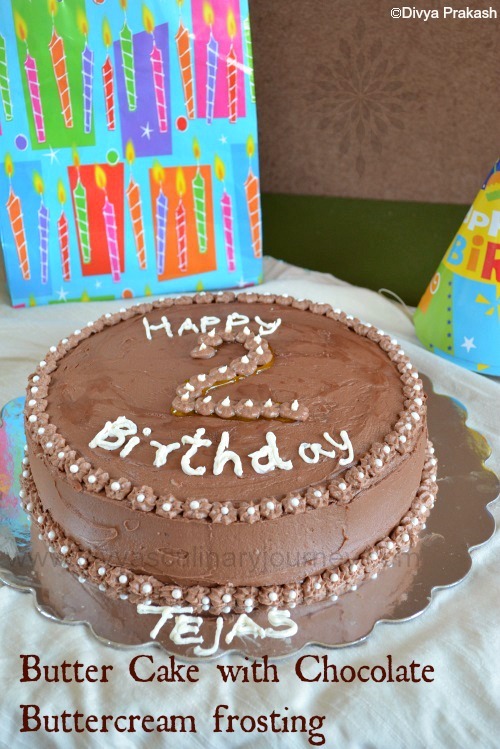 My Son turned 2 last week and we had a birthday party at home. 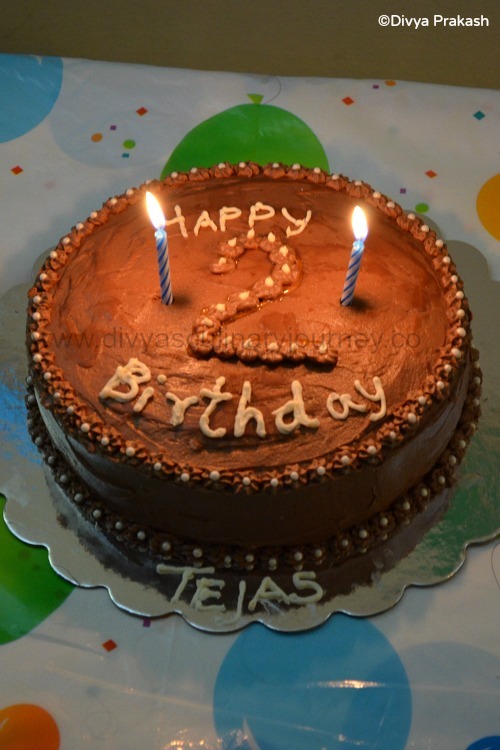 Just thought will share the party menu here. We had invited around 35 guests with 50% of vegetarians and 50% of non vegetarians. So I wanted options for both. So accordingly did the menu planning. I cooked for the party and of course my friend Geetha helped me by preparing rasam and with frying the pakodas. 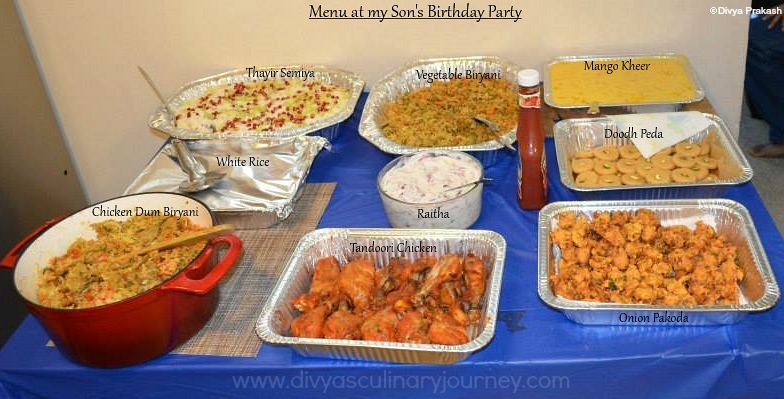 I was so satisfied with the way the dishes turned out and the guests loved it too. You might wonder where I disappeared suddenly. 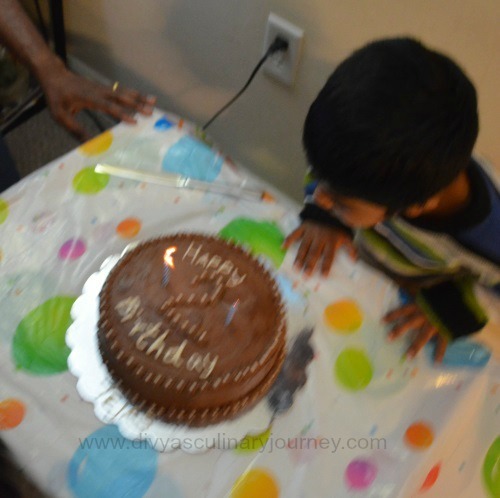 It has been more than a week since I posted anything, blog hopped or even I haven't been active in Facebook. 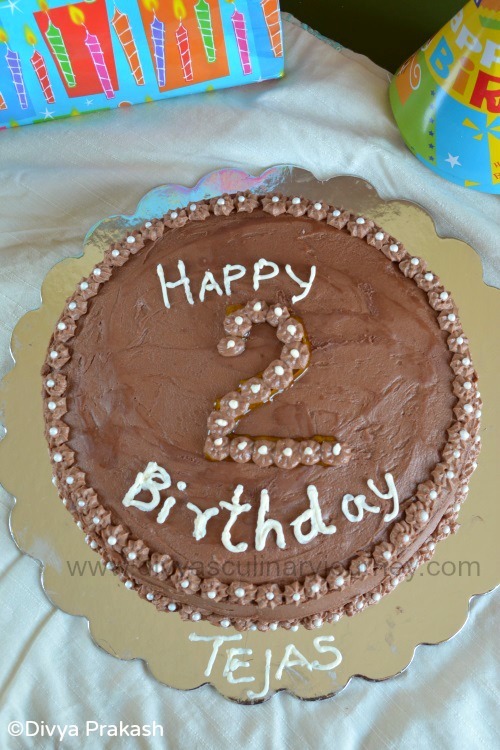 My son turned 2, last week and we had a party this weekend. 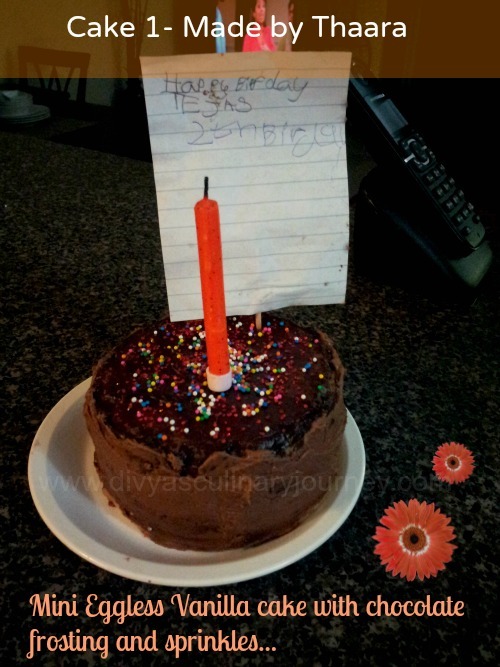 Preparing for the party and cooking took up all my time so couldn't spend time for blogging. Now that the party is over, I am back to blogging and will be sharing the recipes I made for the party in the coming days. 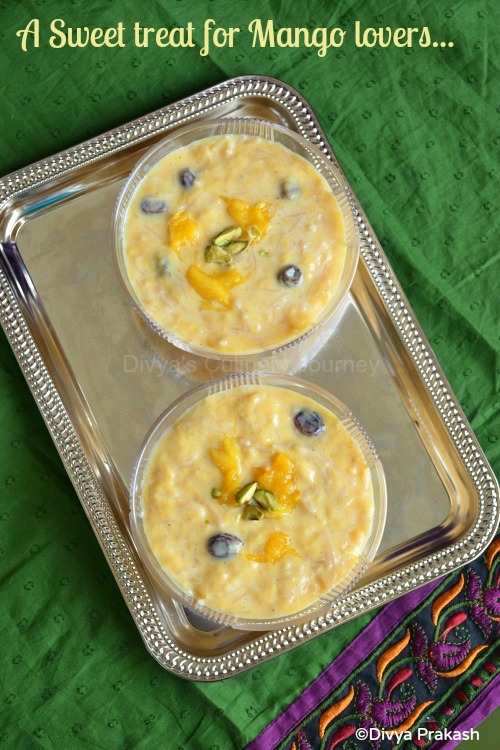 Today's recipe is the Mango Kheer I made for the party and I am so glad that everyone loved this kheer. 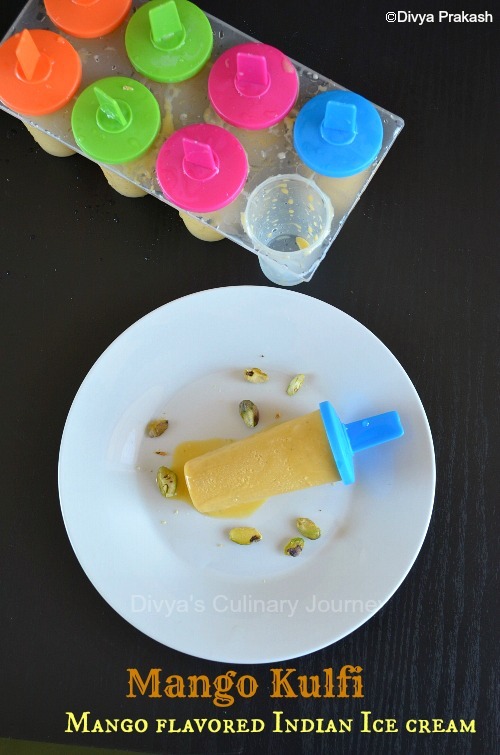 Peel the cardamom, discard the skin and Powder the seeds with a tablespoon of sugar and keep it aside. In a pan heat a teaspoon of ghee and fry the vermicelli till it is lightly golden. Then add the milk to it and let it simmer till the vermicelli is cooked. Then add the sugar and condensed milk and bring it to boil and let it simmer for few minutes. Then add the powdered cardamom mix well and turn off the heat. Then let it cool completely, then add the mango pulp and mix well. 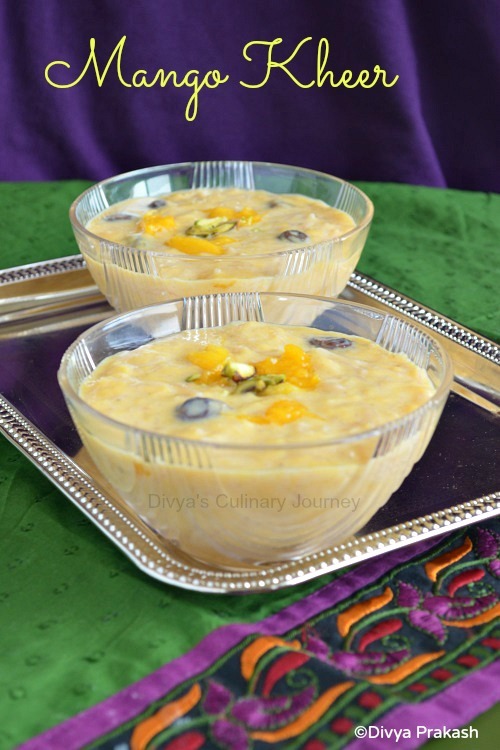 Fry cashews and raisins in ghee and then mix with this and also add the diced mangoes and mix well and serve. 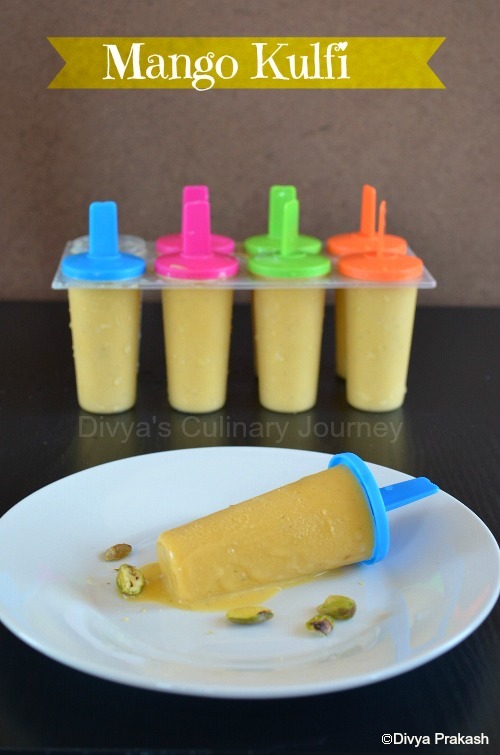 I have used canned sweetened mango pulp so used less sugar. 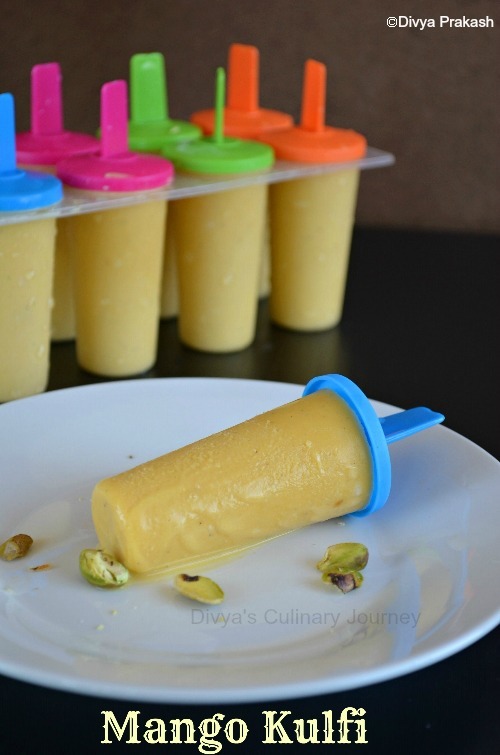 In case if you are using fresh mango pulp adjust the sweetness accordingly. If you prefer less sweet you can omit the sugar too. Instead of vermicelli you can use sago/javvarisi too. I have prepared this combo once before and i just loved the combo. 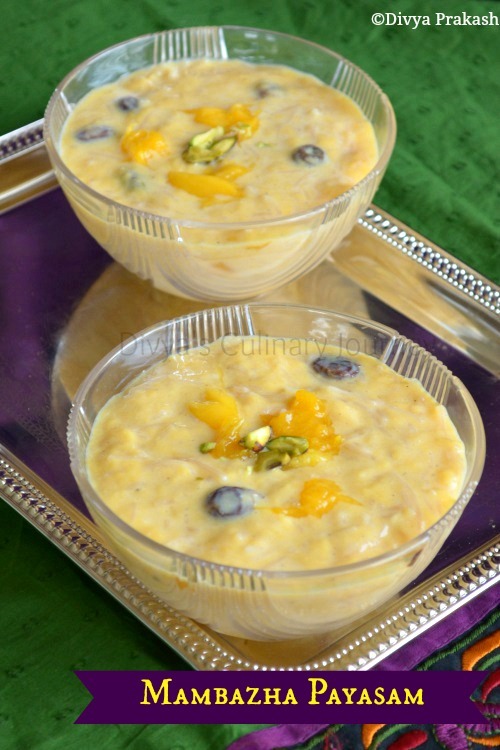 The kheer can thicken up after sometime, so before serving dilute it with milk to the required consistency. The amount of cashew and raisins can be added as per your personal preference. Adding fresh fruit is purely optional. But I would recommend adding it. 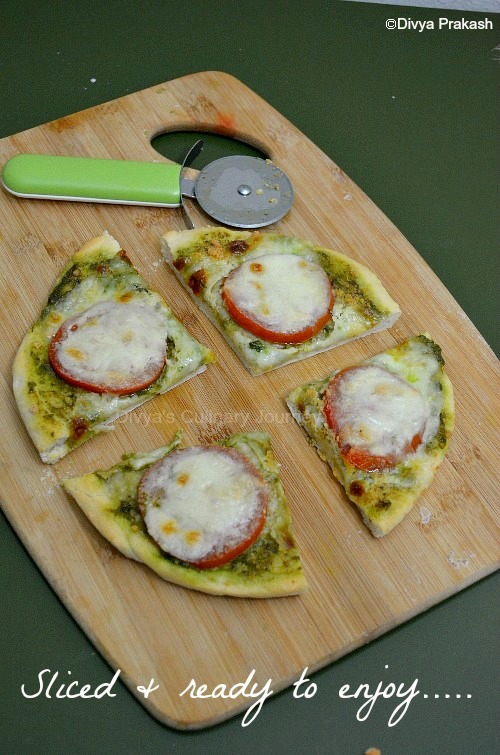 Today's recipe is Naanizza. You might wonder what naanizza is? 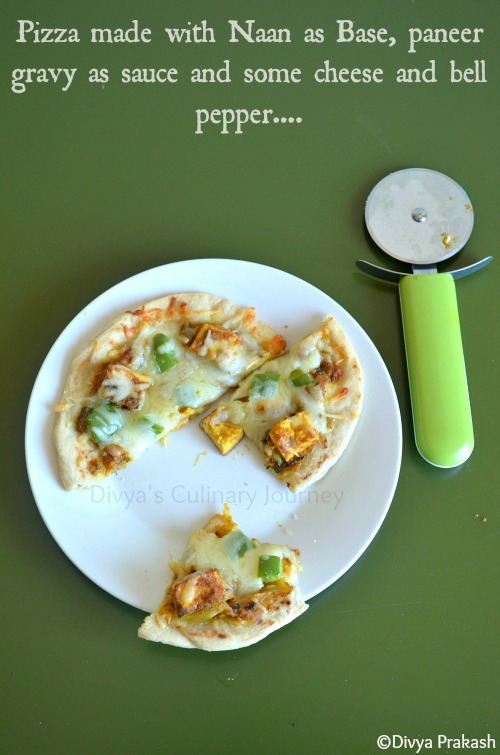 With naan as a base, paneer gravy as sauce and with bell pepper and mozzarella made these pizza. 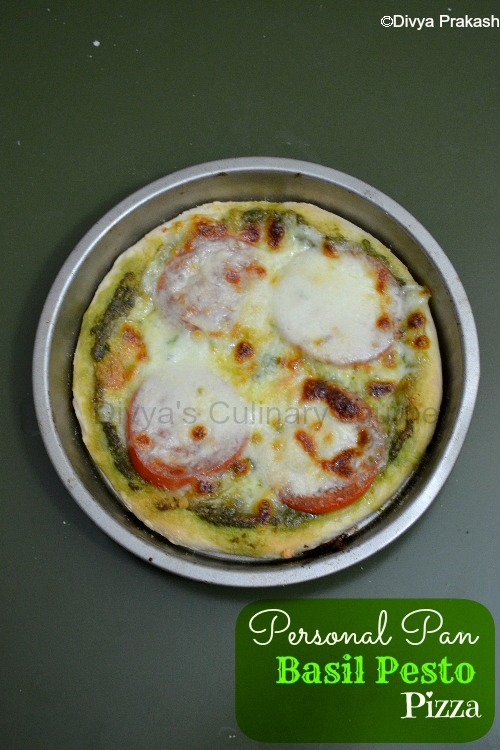 It tasted awesome and everyone at home just loved this.This is so easy to make and is ready in few minutes. 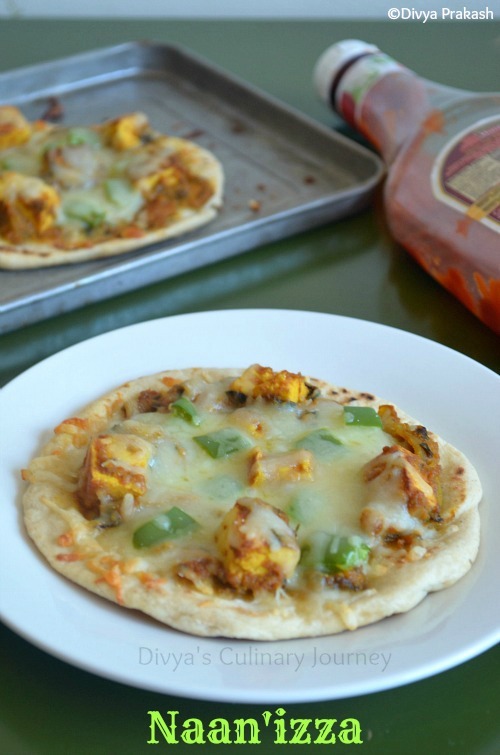 This is a great way to use leftover naan too. Naan Bread , 2 nos. 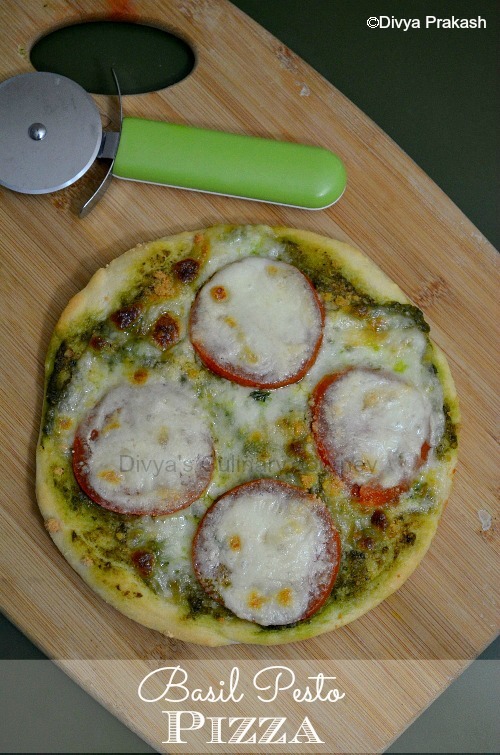 Brush olive oil in one side of the naan and place it on a baking sheet and bake for 3 minutes. 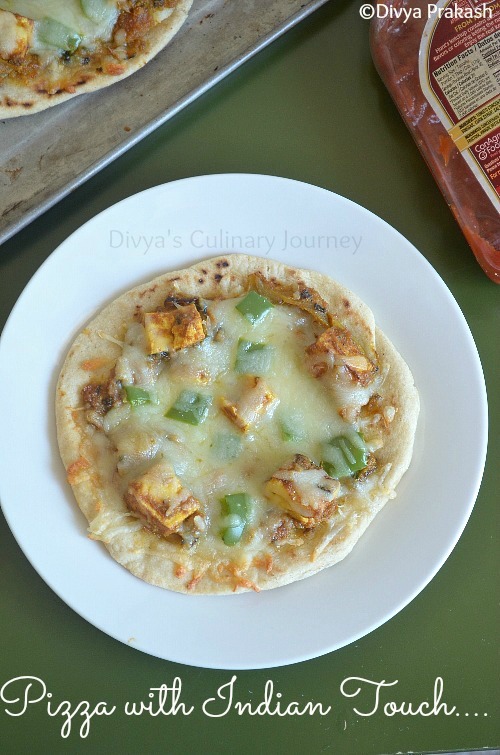 Then take out, spread the paneer masala as needed, leaving 1/4 inch border around the naan. Then arrange the diced bell pepper, and then sprinkle mozzarella and bake for 6-7 minutes. 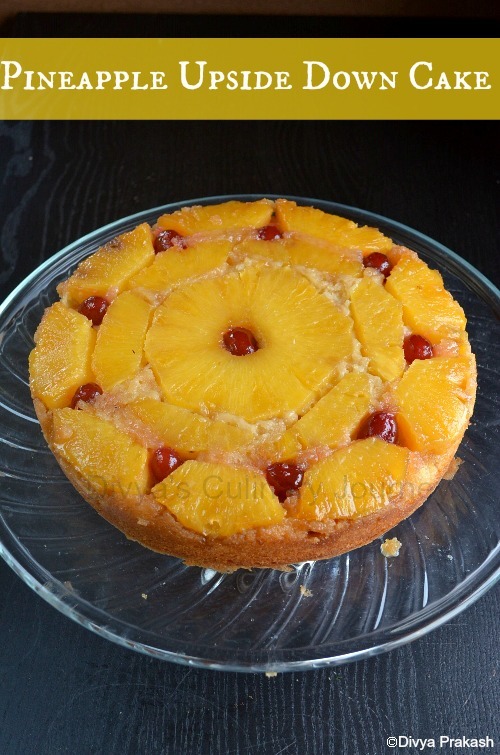 Then take out, slice and enjoy. 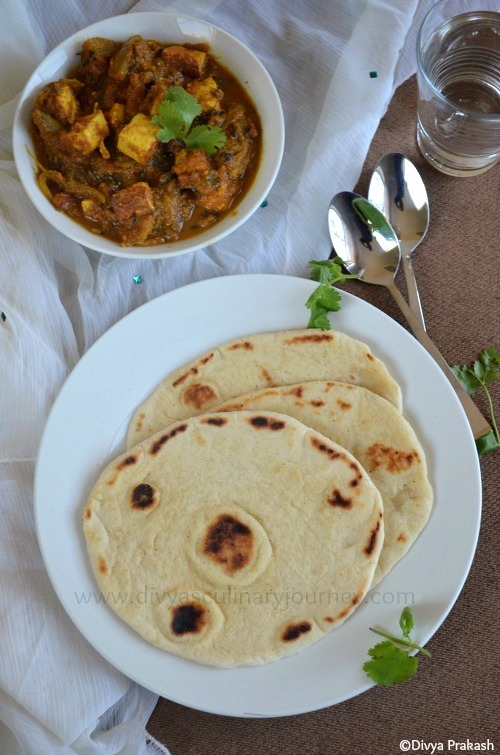 You can use home made or store bought naan. Depending on the size of the naan the requirement of gravy varies. My naans were on the smaller side and they required less than 1/2 cup of the masala. You can use any other gravy of your choice too. 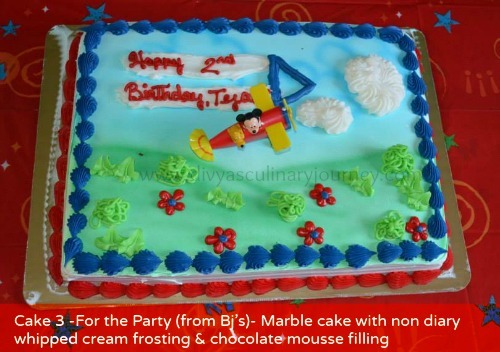 You can use different toppings of your choice too. The quantity of cheese is also based on your personal preference. 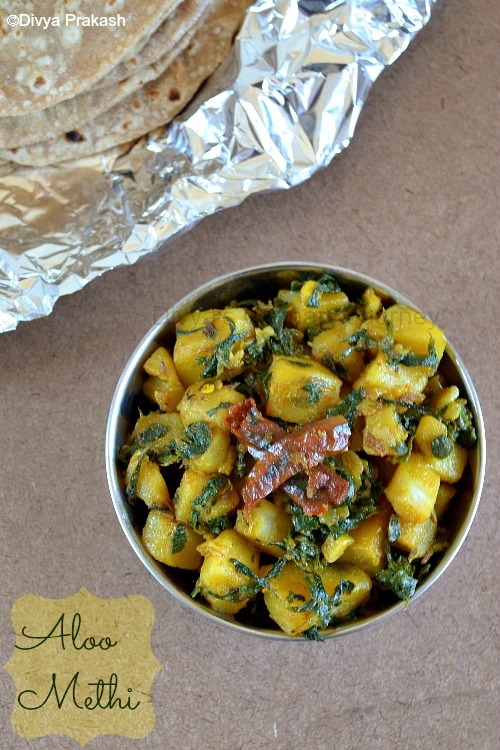 Today I am here with Aloo Methi recipe- Potatoes cooked with Fenugreek leaves. Who does not like potatoes? 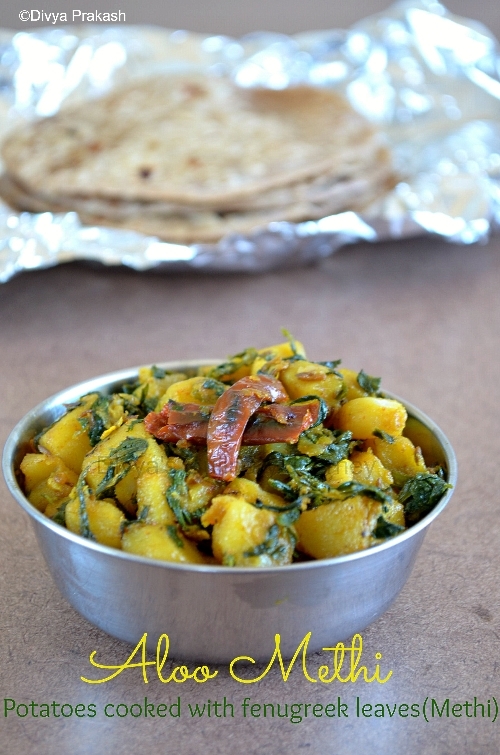 The potatoes get an incredible flavor from the fenugreek leaves. Also these are healthy. 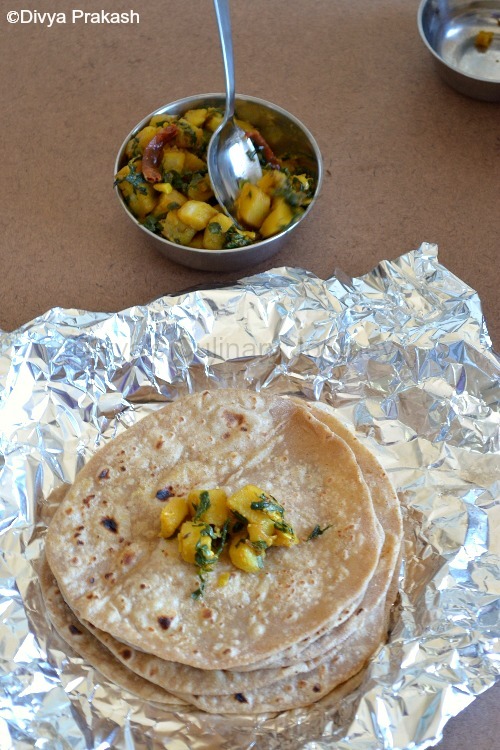 They can be a wonderful side dish almost for anything, be it rice or rotis. Dry red chillies, 2-3 nos. Heat oil in a skillet, add cumin seeds and then add red chillies and fry for a minute. Then add chopped onion, ginger, garlic and asafoetida and saute for few more minutes. Then add the turmeric powder, Chilli powder, Coriander Powder and chopped potatoes, mix well. Then add salt to taste, mix well, sprinkle some water and cover and cook till the potatoes are half cooked. Then add chopped and cleaned fenugreek leaves, mix well and sprinkle some more water(if needed), check the salt and cover and cook till it is completely cooked. Then add amchoor powder, mix well and serve. If you dont prefer onion, garlic, ginger you can avoid them. Adding amchoor powder is optional. Boil, peel and cube the potatoes. Heat oil in a skillet, fry cumin seeds, chillies, asafoetida and other listed ingredients. Then add the fenugreek leaves, mix well, cover and cook. To this add the chopped potatoes and mix well, cook for 2 more minutes and then turn off the heat.